1. 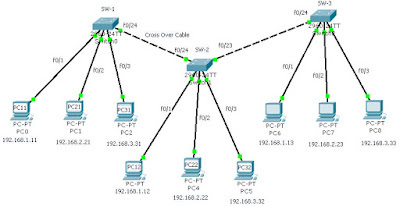 Understand how to setup VLAN. 1. Basic command of switch: enable, config terminal, hostname, banner, exit, end, show, no, etc. Enter TEXT message. End with the character '$'. 9. Do the exactly same steps with Switch 2 (except hostname). 10. Setup the PCs’ IP address (refer to the topologic graph above). 11. Use “ping” to verify the isolation. 1. For more information, please visit my blog http://jhuang8.blogspot.com/. 2. Video demo is located in http://www.valit.ca/lab/.